I managed to get a quick nine holes on Tuesday afternoon, a rarity this very busy fall. The course is actually in fantastic shape, but my schedule has left few holes for these opportunities. I shot a very respectable 42 on the nine I did play, but had to walk off after nine in order to attend to some at-home activities. It was a great season. I played upwards of 70+ rounds of golf I figure, and of course (you remember!) I hit the now attainable sub-80 round. I have really enjoyed my five years as a member of Coloniale Golf Course, and I will certainly miss the freedom of running off to the course whenever I like on a summer's day. Kathleen and I are expecting our first child this coming April, which far more exciting than any of the excitement I had playing the great game. I'm sure I'll get out and play a few games next season, but certainly not with the ferocity I have in the past years. And perhaps our little one will grow up to be the next Annika, or Nicklaus, and I will be the first one to teach them to keep their head down, and arm straight. I'm back recently from our yearly trip through Kimberley BC, playing some of the best courses in that area, including two new courses - Shadow Mountain and Wildstone (A Gary Player design). We also played St. Eugene, Bootleg Gap and of course Trickle Creek. All fantastic courses. My scores, however, not fantastic. 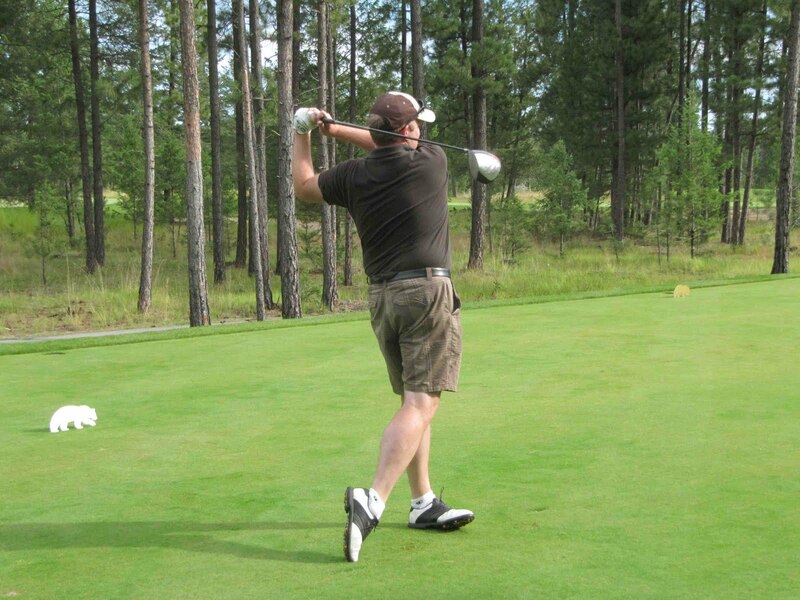 However, someone took this photo of me on the #1 tee box at Shadow Mountain at the tail end of my swing. I think it's great shot, nicely balanced swing finish. It was, unfortunately, the best shot I hit all week. We are still on our cross country road trip, currently on our last day in Ottawa, and we have played what is likely going to be our final round of the trip. The first three rounds were on spectacular, yet difficult, courses in Saskatchewan, North Dakota, and on the Bruce Peninsula in Georgian Bay. Most my rounds were in the high 90s, if not low 100s, but most of them were on the start or end of a long trip on the road. Today we played a childhood favorite course of mine near Winchester Ontario called Cloverdale Links. A nice links course, but friendly. HOWEVER - I BROKE 80!!!! The other funny part of the story was that we had great weather, albeit windy, but the storms stayed away from us, until the last hole, after our drives, and before our approach shots the heavens opened up, and not a small rain but 1 step away from an all out hailstorm. My playing partners picked up and huddled under their umbrellas. I wasn't going to quit though, only needing a double to break 80. So in the driving rain I hit my gap wedge on the green (this being my 4th shot actually after a penalty for putting my drive into the fescue), I knew I only need a double bogie to break 80, giving me 3 puts for a 79. I hammered my long 80 foot putt up the hill to within gimme range for bogey, and tapped it in for the 78. Cheering on the green, while being soaked from head to toe. Today Kathleen and I leave for an extensive road trip. Our furthest destination will be Ottawa to visit my family, but the loop will carry us through the prairie provinces, the upper portions of North Dakota, Minnesota, Wisconsin, and Michigan, crossing at Sault Ste Marie. After a two day stay at Kathleen's Dad's on the Bruce Peninsula we continue to Ottawa. We have tee times starting tomorrow at Dakota Dunes south of Saskatoon (A Canadian tour stop), The King's Walk in Grand Forks North Dakota (an Arnold Palmer course) and Cobble Beach Golf Resort in Owen Sound Ontario (one of the top rated Canadian courses). Our travel home from Ottawa will include stops in Toronto and Chicago for some MLB games (Jays VS Yankees, and Cubs VS Marlins), and then through Illinois (a brief appearance by Indiana), on through Southern Michigan, Wisconsin, skirting the top of Iowa, trekking through South Dakota (including Mount Rushmore and Deadwood) cutting through the corner of Wyoming and passing through various points of eastern Montana before hitting the southern Alberta Border and on to home. When all is said and done, We'll have been on the road for 21 days and nearly 10,000 kilometres (about 6200 miles). Managed in another 18 holes this morning, a bit last minute. Again, had a stellar start getting through the first seven holes at even par, then an acceptable bogie on 8 - followed by an unacceptable triple on nine which left me at four-over 40 on the front. The "fun" continued on the back going triple, double, and bogie on 10-11-12, a glimmer of hope on 13 with a birdie, good bogies on 14 and 15, but a tough double, bogie, and triple to finish 16, 17 and 18 to come in at 49 for an 89 total. Putting on the front nine was fantastic - just 12 puts over 9 holes, including two 20+ foot par saves. Aside from hole 13, there really was nothing good to talk about on the back. Now I really am leaving - see you June 15th. It's been a while since I've golf blogged, even though I've played quite a few rounds, including a day where I managed 45 holes in about 8 hours (with a lunch break). Today ... well, today was nearly a career round. I shot 85, which is the best round of the year (I've had 86 twice this year) but the real story is that on the first 9 holes (which was the back nine today) I shot a 38. Best 9 hole round ever I think. just two bogies and 7 pars. the back nine started well - pars on 1 and 2, bogies on 3, and 4, and then ... disaster. A nine on the par 4 5th. After that I sort of gave up, one more par, a double and finished in with two bogies for a 47. The round that could have been! The quintuple was definitely the turning point, putting my third shot in the water, and then hit my dropped shot into the deep green-side bunker, thinning over the green, and a chip and two putt for nine. Anyhow, I'm on a business trip now for about two weeks, so no golf for me. See you after June 15th. NEW CLUBS! I have six new clubs in the bag - a TaylorMade Burner driver, a new 3 and 5 wood (Adams Speedline Fast 10s) and three new wedges by Adams (Tom Watson design) 52 degree gap, 56 degree sand and 60 degree loft. Scores are likely to reflect a setback as a result as I get used to them, but so far, I really like them. Just so you don't think I'm cheating, I have retired my Nike Ignite, my Orlimar fairway woods, and my Nike wedges. Anyone want to buy some used clubs? I had thought about getting new irons, but I think that can wait another year, still really like my Calaway Big Berthas. I would however, not be opposed to finding some hybrids for my 3 through 5 irons. Here are the stats for today's round at Coloniale. The Good - LOVE the new wedges, especially the 60 degree. A degree of loft I've had an on-again, off-again relationship with - however, from 90-100 yards, it is now my club of choice, as well as those deep pot bunkers, of which we have a few. The new driver is also going to be good - but it will take some getting used to. Had some bad misses with it today, but also some spectacular results. Will definitely take some range time to get the timing down. The Bad - Well, driving I guess (even thought it also falls under good), when they were bad - they were very bad. The wind was still a little up, but no where near as bad as the weekend. The ugly - the Mosquitoes! They are now out in full force I'm afraid. The cologne of the summer will be Deep Woods Off. A nice late may frost would be nice to kill them off, but that doesn't look like it's going to happen now. Conductor, singer, organist, blogger, and golfer. Living in Edmonton Alberta, Canada, with my wife and two needy cats. "Podium Speak" is my main choral music blog. The rest are my choir and teaching blogs. "Chipping from the Brough" is my Golf Blog.